There is no better way to end a year than on a high note which is why I always wait until the 31st to make my big charity contribution for the year. It is sent on behalf of all of the dogs that I've had the pleasure of hanging out with throughout the year. For 2015, I am thrilled to send HugABull Advocacy and Rescue Society a big cheque! While HugABull is well-known for their adoptions program, you may not realize just how much other work they do right here in New Westminster. In 2011, HugABull presented to City Council requesting a review of the Animal Control Bylaw. 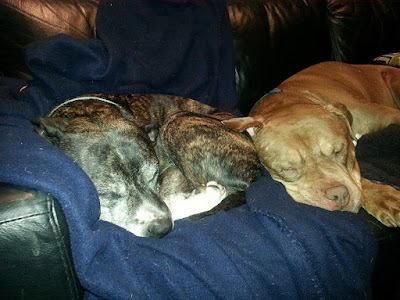 Our bylaws were outdated and included breed-specific legislation (BSL) that targeted "pit bull" & mastiff breeds, labeling them as vicious which subjected them to restrictions based solely on how they looked. 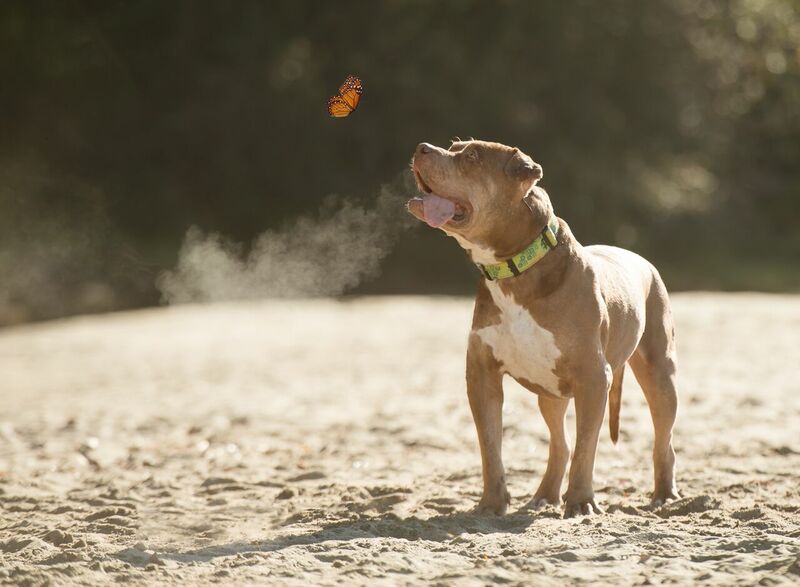 BSL isn't consistent with best practices or animal behaviour research and organizations around the world, including the BC SPCA, recommend breed-neutral legislation that holds owners responsible for their dogs' actions. Thanks to HugABull's involvement and the overwhelming community support, City Council adopted a highly progressive, breed-neutral Animal Control Bylaw. 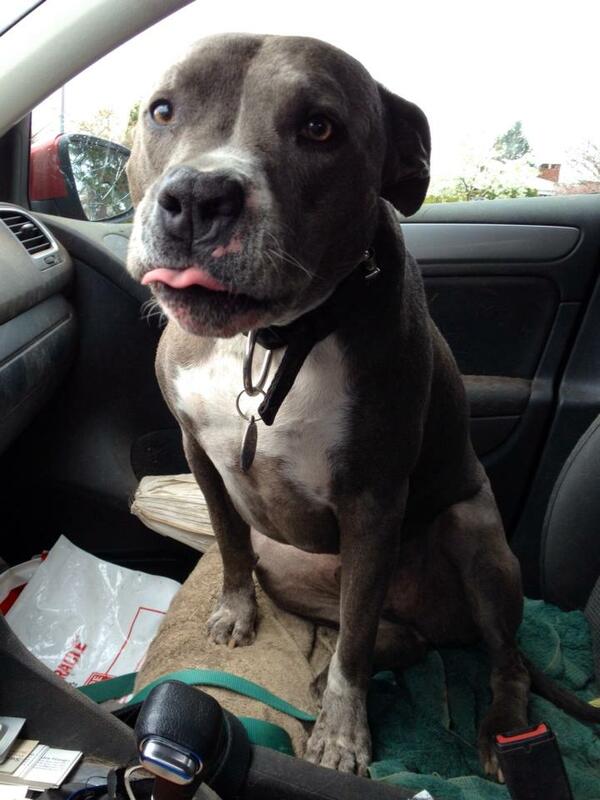 Levi, a New Westminster resident, was once required to be leashed & muzzled at all times because he's a "pit bull". Now he enjoys the same freedoms as every other dog and shows off his comedian side on car rides. HugABull partners with the Animal Services department to offer the Community Pet Outreach Program. They connect with pet guardians who are low-income, or face barriers, to provide them with the information, equipment, and resources to care for their pet. Once a year they hold an outreach event at Moody Park where people can access food, humane training equipment and training advice. HugABull also works with Queen's Park Pet Hospital to offer the Fixabull program that provides subsidies for spay and neuter surgeries. These procedures are not limited to pitbull-type dogs, but any breed - and cats, too! They believe that all animals deserve a long, healthy life free of unwanted litters so over half of their subsidy recipients have been cats. In 2015, HugABull pulled several dogs from the New Westminster Animal Shelter into their adoption program. With the stigma that surrounds "pit bulls", they are often to slow to be adopted causing them to sit in the shelter for a long time. Bully breeds are very human-oriented and often deteriorate in a shelter environment while waiting for a family to adopt them. 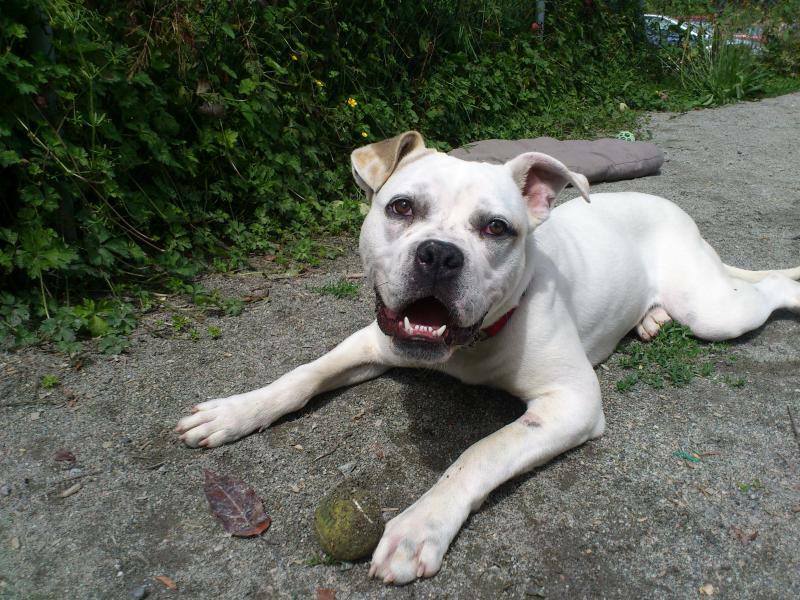 Chase is an American Bulldog/Boxer cross who was young, untrained and VERY high energy. He would literally bounce off the walls of his kennel at the shelter. HugABull took him into foster care where it took about a year for him to settle down and learn some manners. He has now found a fantastic home with an active dad and a huge yard to burn off his crazy Chase energy! Stella is a senior who has a lovely temperament and is a real catch, but was overlooked in the shelter due to her breed and age (9 years). She settled easily into foster care and was adopted by a friend of the foster family who quickly fell in love with her. Moxie was originally adopted from the New Westminster Animal Shelter. Unfortunately, her new home decided she wasn't a fit for them so the shelter contacted HugABull and they were able to work together to transition her directly into foster care. The home environment makes such a difference and truly allows Moxie's sweet and loving personality to shine. 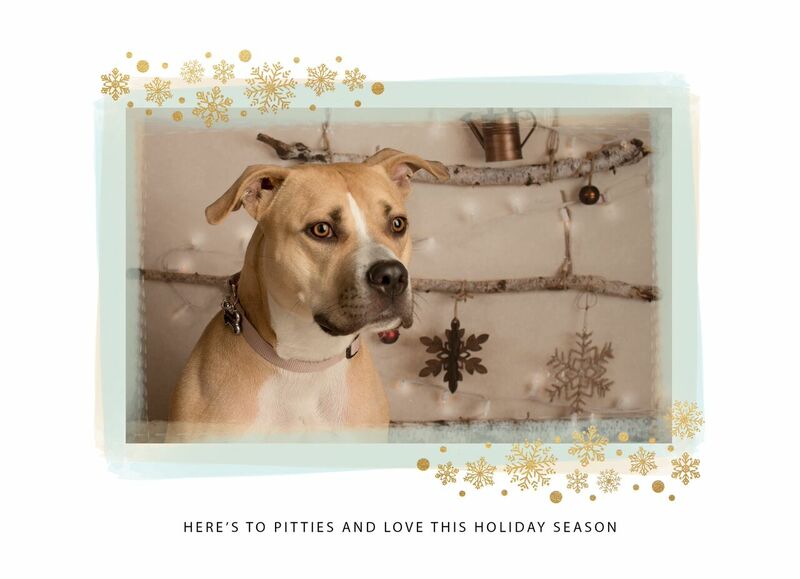 Moxie's holiday wish is for a forever home of her own. When a dog comes into HugABull's care and is found to have serious or terminal health issues, they may be placed in their Compassion Care Foster Program instead of being adopted out. HugABull covers all of the dog's expenses while special families open up their homes providing a roof and love for the remainder of the dog's life, short as it may be. Notch was found collapsed on a stranger’s doorstep, extensively scarred and with open wounds all over his beautiful, big head. 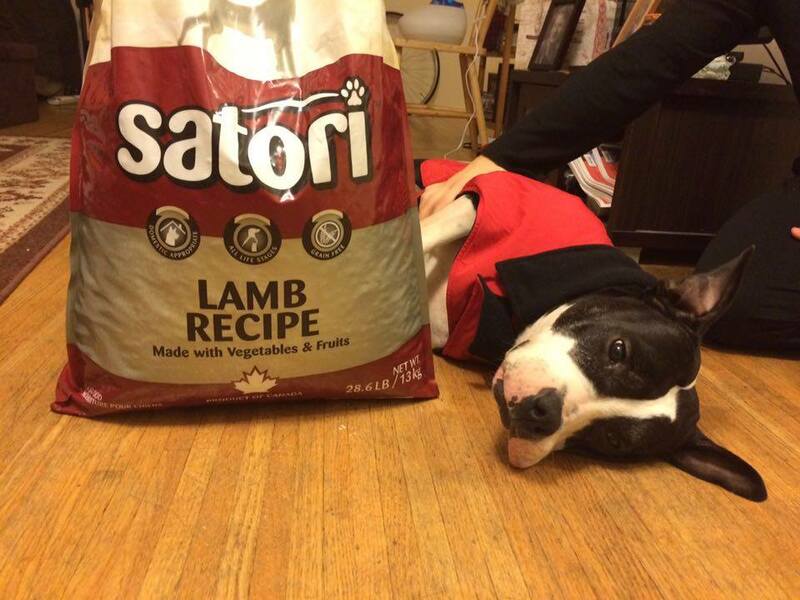 He was picked up by the SPCA and quickly won hearts at the shelter, even as his list of health problems grew. He has a heart murmur, no front teeth and poor mobility due to hip dysplasia and untreated past injuries. He also required an obstruction surgery that was followed by complications causing intestinal scarring so he will require a special diet for life. While his health issues qualify for him for their Compassion Care Foster program, they don’t hold him back. Notch is a cuddly, toy-crazy, silly boy that brightens up anyone's day. That kind of resilience has to be rewarded with an amazing retirement home and HugABull is privileged to be the ones to give it to him. Notch (right) and his sister, Chica. They live in New Westminster with their awesome people who have been working with HugABull for many years. Notch is featured in the 2016 HugABull calendar. Just one of many adorable pictures of this sweet boy! The Swim, Bark, Run! donation to HugABull will be used to sponsor Notch's care. He is an amazing boy that is impossible not to love. Thank you for all you do, HugABull. You are one special group! For more information on HugABull and all of the amazing work they do, check out their website: www.hugabull.com. Their work is endless and they count on the support of the public to be able to do it so don't hesitate to send them a donation while you're visiting their website. Swim, Bark, Run! 2015. Picture Window theme. Theme images by Josh Peterson. Powered by Blogger.